The tap never runs dry along the South Shore. Find your favorite ale, stout or lager; dive into full-bodied beers, a hoppy IPA or a fruity and flavorful seasonal brew on your journey. Plan your tour with ease when you download the South Shore Brewery Trail App on Apple&apos;s App Store or Google Play. The majority of the South Shore breweries offer food selections - ranging from gourmet cheese plates to pub classics. For a full menu, visit Crown Brewing for freshly made pizza and award-winning beers under one roof. Bulldog Brewing in Whiting offers daily specials from fish and chips and ribs to burgers and tacos. Ale lovers will enjoy a stop at Hunter&apos;s Brewing in Chesterton; featuring a variety on tap as well as guest features - including sours, ciders and even a ginger beer. Griffith, a small centrally located town only six-miles from the Illinois/Indiana border, is home to three craft breweries. Be sure to pop into Wildrose Brewing for American craft beers, Pokro Brewing Co. for European style beers and New Oberpfalz Brewingto experience traditional German ales and lagers. Stop at Four Fathers Brewing for a mix of traditional and revolutionary, and to top it off, they serve beer cheese and bacon popcorn to their hungry patrons. Check out St. John Malt Brothers for a production brewery with a classic tasting room. Two of the oldest breweries in the South Shore are Three Floyds in Munster and Shoreline Brewery in Michigan City. Three Floyds is an internationally recognized brew pub making regional, seasonal and collaborative brews since 1996. Shoreline Brewery has an expansive space and has twelve beers on tap; including their award-winning, seasonal and diverse Barrel-Aged brews. Open Thursday - Sunday, Burn &apos;Em Brewing offers a variety of beers on tap. Stop in for a flight to enjoy porters, stouts, ales, and IPA selections. Join the conversation at Ironwood Brewing Co. in Valparaiso with craft beer fans and taste their malt-forward brews featuring local ingredients. Byway Brewing in Hammond is conveniently located off I-80/94 and Kennedy Avenue. Their taproom is family-friendly and offer a chef-driven menu and friendly atmosphere. Don&apos;t forget about the beer - where you can enjoy year-round brews as well as small batch beers in the taproom or the Production Pub. Enjoy a full menu including wood fired pizzas and burgers and delicious handcrafted beers on the patio at Off Square Brewing in Crown Point. 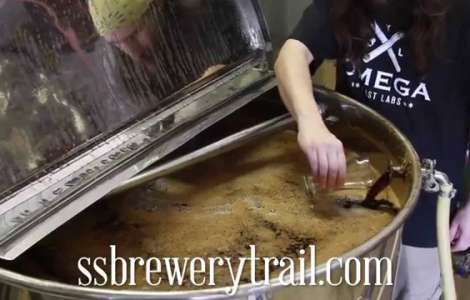 No matter where you start your journey along the trail, you&apos;ll experience some Hoosier hospitality, enjoy tasty traditional and experimental beers and probably meet a friend or two! Jump on the bus and leave your keys at home to enjoy the South Shore Brewery Trail with your friends. Epic Limo Inc.specializes in brew tours on limos or party buses. Guests can choose which breweries they would like to visit. "Hop" on the South Shore Brew Bus to visit three or four different breweries for an hour each. Book the whole bus for a private tour with your friends; all you have to do is sit back and enjoy the ride. With the craft beer community constantly growing along the South Shore, various brew festivals provide visitors an opportunity to sample numerous breweries' beers while enjoying live music and food sampling. Valpo Brewfest, hosted at Central Park Plaza, features samples of more than 100 different brews and the chance to vote for Indiana's Best Beer. Three Floyd's infamous Dark Lord Day marks the one-day release of their Dark Lord Russian Imperial Stout, and attendees can enjoy live music and sample brews from all over the world. Crown Beer Fest, hosted by Crown Brewing at the Lake County Fairgrounds, offers attendees beer samples from Indiana, Illinois and other surrounding states during American Craft Beer Week. At Munster Ale Fest in October you can explore the flavors of local and nationwide craft brews as well as some of the finest local food vendors. Not only is there a great selection of craft breweries along the South Shore, there are also numerous home brewing suppliers. Northwest Indiana Brewers and the South Shore CVA unveiled the 100th South Shore Poster in the series, titled, "Cheers to Region Beer." 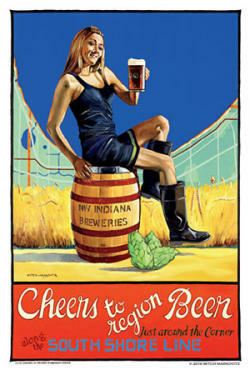 The poster highlights the region as well as the breweries and their craft beer. The painting was done by artist and illustrator Mitch Markovitz. Posters are available in a 24"x26" for $35 and 12"x 18" for $25. Find breweries nearby, receive push notifications with the latest news and specials plus a whole lot more.